This year, the American team will be the visitors and will wear grey uniforms on gameday. Returning for his second Under Armour All-America Game is OF Dazmon Cameron. Joining him on the American squad are players from eight US states and one Canadian. The traditional warm weather states are well represented on this roster: Florida (6), Texas (4), Georgia (3), California (2). 9,Luken Baker,RHP,R/R,6-4/245,2015,Oak Ridge,Spring-TX,Texas Christian Univ. 24,Dazmon Cameron,OF,R/R,6-1/185,2015,Eagle’s Landing Christian,McDonough-GA,Florida State Univ. 21,Devin Davis,1B,R/R,6-2/210,2015,Valencia,Santa Clarita-CA,Loyola Marymount Univ. 2,Brendan Rodgers,IF,R/R,6-0/195,2015,Lake Mary,Longwood-FL,Florida State Univ. 10,Cole Sands,RHP,R/R,6-3/205,2015,North Florida Christian,Tallahassee-FL,Florida State Univ. Luken is a big, physical presence on the mound. He gets good downhill plane to his fastball that sits comfortably in the 92-94 mph range and touches higher. He also has tight rotation on his low 80s slider and mixes in a developing change. Luken is a solid athlete who has the build to handle innings and the quality stuff that points to front of the rotation potential. He was first identified by the Baseball Factory scouting staff at the Under Armour Showcase – Team One Futures Texas. Seth is one of two underclassmen we’ll see at the 2014 Under Armour All-America Game. He was once considered an Olympic hopeful swimmer, and still owns a pair of national backstroke records. The long levers that once propelled him across the pool now serve to drive his advanced left-handed stroke. His move is loose and full, and he accelerates the barrel through the hitting zone to generate hard contact to the middle of the field. It truly sounds different off his bat, and he has the ability to launch the ball a long way to the pull side. This gives him the makings of the rare hit & power combination, and he’s just a 2016 graduate. The run, arm and field tools are consistent with a high level corner OF profile. Chris is a physical young catcher with one of the best left-handed bats in the 2015 class. His stroke is clean with repeatable power, especially to the pull side. His durable frame and strong hands are well suited to allow him to stay behind the plate defensively. He sits well to receive, and features standout arm strength – has reached as high as 94 mph on the radar gun. Hunter is an intimidating presence on the mound at 6-7 with long levers. He pitches comfortably in the low 90’s and has reached 94 with excellent downhill plane to his fastball. His length and velocity combine to get the ball on top of hitters in a hurry. Somewhat of a late bloomer, he’s made great strides and has started to repeat his delivery such that he is able to compete in the zone with three pitches. His breaking ball has low 80’s velocity with sharp two-plane break, and he also shows a low 80’s change that turns over some to his arm side. A returning player to the Under Armour All-America Game, Dazmon is a dynamic talent with outstanding tools. He has lightning quick hands at the plate with excellent barrel accuracy. In the outfield, he glides to balls with ease and has the instincts and range to play centerfield at higher levels. Dazmon is the total package and the son of former Major League player, Mike Cameron..
OF,R/R,6-1/185,2015,Eagle’s Landing Christian,McDonough-GA,Florida State Univ. Justin is the type of athlete not commonly found behind the plate. He has a well-rounded set of tools, and the ability to play all over the field. Though his actions are easy both defensively and to hit, he makes his body and the ball move with speed. Behind the plate, he features a plus arm along with advanced catch and throw skills. His right-handed stroke is loose and easy, and is built for hard line drives from gap-to-gap. His ability to whip the barrel through contact gives him surprising ability to drive the ball to the opposite field. Devin is one of the top offensive players in the 2015 class, with arguably the best combination of hitting ability and raw power. His right-handed stroke is compact, but he packs a punch and consistently finds the good part of the barrel. It sounds different off his bat, and reacts different as well – he can drive the ball with authority all over the ballpark. He moves around the bag well at 1B and is an athletic young man who is a legitimate run producer. The solidly built Fenter has an advanced mix of quality offerings and pitchability. He has a controlled, repeatable delivery that leads to excellent command of his fastball that sits in the low 90s, occasionally bumping mid 90s. He has a true out-pitch in his hard, late-breaking curveball that has excellent downward bite, and he also mixes in a change with late fade. Mitchell owns a classic left-handed stroke, with a smooth and pure action through the zone. He is arguably among the best hitters in the 2015 class, thanks to his advanced feel, which allows him to apply his previously mentioned stroke against high-level stuff. He squares the ball up regularly to all parts of the ballpark, with power to the pull side. It’s a pleasure to watch him handle the bat. He is a talented and capable all-around athlete with foot speed (6.6 range 60-yard dash) and versatility to patrol all three outfield spots along with the open spaces of the gridiron as a wide receiver. Ke’Bryan makes the game look easy with an impressive skill set and excellent instincts for the game. His right-handed stroke produces hard line drive contact to all fields, and he is unfazed by velocity or off-speed stuff. At third base he has smooth actions with soft hands and a strong, accurate arm. Ke’Bryan is the son of former Major League player, Charlie Hayes. Juan has an outstanding feel for pitching, and showcases an advanced three-pitch mix. He commands his fastball to both sides of the plate, with velocity right around 90 from a slot a little above high three quarters. He’s got advanced feel for his change, and spins a breaking ball with good shape and depth. His delivery is athletic and repeatable, making for a very good overall package. Had he chosen a different route, Bryan would likely be an up-and-coming elite Division I basketball recruit. Instead, the 6’6” right-handed pitcher is leaping up MLB draft boards as his stuff is catching up to his athleticism. He’s posted sub-seven times in the 60-yard dash, and now gets off the mound very well to field his position. He works from a three quarters arm angle and fills up the zone with a three-pitch mix. The fastball has arm side run and sink into the low 90’s. His secondary stuff includes a developing change, a mid-to-upper 70’s curve and a low 80’s slider. Alonzo is a terrific athlete who is one of the fastest players in the 2015 class. His 6.33 speed in the 60-yard dash translates to plus range in the field and puts constant pressure on opposing defenses. He swings the bat with authority from both sides of the plate with bat speed and a clean stroke. He also is a versatile defender with good instincts and soft hands. Alonzo’s combination of speed and offensive ability is difficult to find. Kyler becomes the first player to ever be selected for both the Under Armour All-America Baseball and Football games. To this point, he is better known as the top dual-threat quarterback in the country and has led Allen High School to two straight Texas 5A state titles. In last year’s 16-0 season he threw for 3,248 yards and 40 TDs while also rushing for 1,230 yards and 17 TDs. The amazing thing is that his future might be even brighter on the diamond. His plus speed, overall athleticism and ability with the bat allow him to impact the game each time he steps on the baseball field. He also flashed useable power last spring and the consensus is that he has an extremely high ceiling in baseball once he concentrates more on the sport. His father played professional baseball and was an All-America QB in college while his uncle played several MLB seasons, so the bloodlines are also there. The future is bright for Kyler who is arguably to top all-around athlete for all sports in the entire 2015 class. He is committed to Texas A&M. 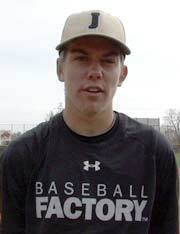 One of the top pitchers in the 2015 class, Mike has a tall, proportioned build and an athletic delivery. He pitches in the 92-95 range, touching 97, and complements his fastball with a tight breaking ball and quality change. Mike is an outstanding athlete who is an accomplished high school QB. stroke is still a bit raw, but he has a knack for squaring up balls in game situations and the ball comes off his bat with authority. He has outstanding raw power and frequently drives balls out of the park to right-center field. He is a plus runner who can play centerfield, but also has plenty of arm for right field. Having only played baseball seriously for a few years, Demi is still fairly “new” to the sport and is advancing at a rapid rate. His tools, body and aptitude give him one of the highest ceilings in the 2015 class. Brendan brings a lot to the table both offensively and defensively. At shortstop, he has excellent instincts with a quick first step leading to outstanding range. His hands, body control and arm make him an outstanding all-around defender. At the plate, he has a quick, simple stroke that results in consistent line drives. He is a comfortable, confident hitter that always seems to find the barrel. A tall, lean RHP, Ashe has an athletic delivery that generate mid 90s fastball velocity. The ball comes out of his hand well and has late life eliciting a lot of swing-and-misses. He compliments his fastball with a low 80s slider with late bite and good tilt. He is aggressive and attacks hitters with his best stuff, with his competitive flair becoming his calling card. Ashe was the 2014 Gatorade Player of the Year in Indiana. Cole features an advanced feel for pitching along with a quality three pitch mix. His fastball reaches into the low 90s with heavy arm side life and good downward angle. He works quickly with an up-tempo delivery, and has command of at least two pitches. His low 80’s change is arguably his best secondary offering – he commands it nearly as well as his fastball, only it has more consistent and sharper action down in the zone. His older brother Carson pitched in the 2013 Under Armour All-America Game, and went on to sign with the Chicago Cubs after being selected in the 4th round of the 2014 MLB draft. RHP,R/R,6-3/205,2015,North Florida Christian,Tallahassee-FL,Florida State Univ. LT offers scouts a chance to dream on a variety of future profile options. At 185 pounds, his 6’3” frame has room to fill out such that things stand to change quite drastically for him, especially with the bat. He’s got a loose, pretty left-handed stroke with natural lift that could easily develop into a power-producing machine as he gets stronger. Defensively, he has the athleticism, versatility and arm strength to play anywhere in the infield, allowing for profile options up the middle if you bet on the glove, on a corner if you bet on the power, or as a utility guy if you bet on the versatility and instincts. Kyle is an extremely talented young player with a left-handed swing that does damage. He has an advanced approach and shows the ability to handle high-level pitching already. He drives balls to all fields and finds the barrel consistently. As a defender, he glides to balls and throws accurately and with carry.